Memphis Sound kicked off its inaugural season with performances in downtown Memphis, Tenn., and for local media on Friday, June 13, 2003. 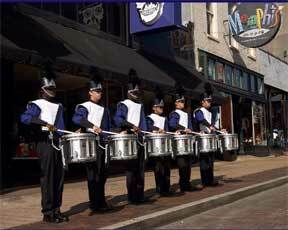 Memphis Sound's snare line performs on historic Beale Street. Memphis Sound actually began its tour of downtown Memphis on Thursday evening, June 12, by performing the National Anthem for the Memphis Redbirds, the triple-A baseball affiliate of the St. Louis Cardinals. The next morning, the corps left their local housing facility at 5 a.m. in order to perform live, from 6 to 8 a.m., on world-famous Beale Street for the local FOX TV morning program. Later that morning, the corps performed for the patients and staff of St. Jude Children's Research Hospital. Memphis Sound concluded its performances with a concert at Court Square in the heart of downtown Memphis.